Freeport, Grand Bahama Island - Mackey Media Ltd is pleased to announce the launch of the internationalexpertsforumbahamas.com registration and information website for residents interested in attending the one-day International Experts Forum scheduled to take place Saturday, January 7, 2017 at the Grand Lucayan Resort. 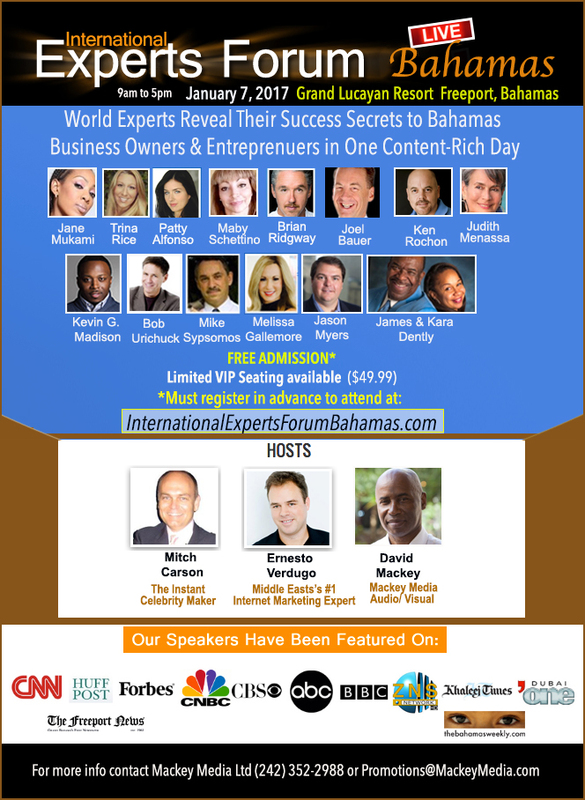 International Experts Forum Bahamas is a free admission motivational event that will feature 12+ highly successful International presenters in one day. There is also a $49.99 VIP option that provides preferred seating and includes lunch with the speakers at the fabulous Grill Restaurant at Port Lucaya. There will be 9am and 1pm sessions, 135 seats per session all persons interested in attending must register in advance through internationalexpertsforumbahamas.com as soon as possible. David Mackey the on island event coordinator went on to explain the last minute nature of the event stating, "The opportunity to team up once a gain with International Seminar promoter Mitch Carson and The Middle East's Leading Internet marketer, Ernesto Verdugo presented itself at the 11th hour and while I could have opted out, I went for it because of the credibility of the presenters in the Carson - Vedugo network and the needs of our community. Rejuvenation along with an infusion of positive motivational energy, for a no cost option was a no brainier that I could not pass up for Grand Bahama. God knows the despair so many of us feel in the aftermath Matthew. If we can make International Experts Forum Bahamas happen in a big way now, we will be in the running to repeat this as a part of the regular circuit along with Dubai, Cairo and the other locations." International Seminar promoter Mitch Carson emphatically guarantees that "Attendees will end their day feeling inspired, touched, motivated and full of ideas to implement in their personal and professional lives immediately." Carson went on to express his pleasure with the volume of registrations thus far stating that he looks forward to an event that will leave attendees with renewed strength, vitality and motivation to achieve great successes in 2017." Mitch Carson is no stranger to Grand Bahama Island, having been a part of three other events in Freeport, including Bahamas Social Media Summit along with Mackey Media Ltd in April 2016 and Mitch Carson’s Mastermind Bahamas in December 2015. Mitch Carson along with David Mackey of Mackey Media Ltd were also guest speakers at various Rotary clubs on Grand Bahama in 2016. This unprecedented event to take place in the Bahamas is a clone of a very successful series of events that Messrs. Carson and Verdugo conduct in Dubai and are quite excited to bring to Freeport. Ernesto Verdugo also participated in Mitch Carson’s Mastermind Bahamas 2015. So what is International Experts Forum Bahamas? International Experts Forum Bahamas is very similar to TED and TEDx. TED (Technology, Entertainment, Design) is a global set of conferences run by the private non-profit Sapling Foundation, under the slogan “Ideas Worth Spreading.” They address a wide range of topics within the research and practice of science and culture, often through storytelling. Similar to TED and TEDX, attendees of International Experts Forum Bahamas will have the opportunity to experience 12+ speakers sharing their wisdom inside a 7-minute format. Stepping Into Your Power: Unlocking Your Optimum Potential Health and Inner Genius. The Experts Forum will start promptly at 9:00 a.m. and will conclude at 5:00 p.m. Persons can join the FULL day or can come during the morning or in the afternoon. We are limited to 135 seats during each session. Please select your session time while registering.